LAHORE: (Thursday, April 5, 2018): Punjab University Vice Chancellor Prof Dr Zakria Zakar has said that this is dire need of the hour to adopt modern methods of investigations and utilize DNA analysis reports for reaching out to the real culprits and curb crime. He was addressing a symposium on DNA in crime investigation organized by Centre for Excellence in Applied Molecular Biology at Al Raazi Hall here on Thursday. Renowned religious scholar Maulana Raghib Hussain Naeemi, senior research officer CAMB Manzoor Hussain, renowned forensic lawyer Abdullah Usman, renowned psychologist Dr Rukhsana Kausar, Director CAMB Dr Nadeem Sheikh, Chairman Department of Zoology Prof Dr Javed Iqbal Qazi, faculty members and a large number of students were present on the occasion. Addressing the seminar, Dr Zakria Zakar said that we must benefit from modern methods of inter-disciplinary research for comprehensive investigations of crime. He said that new therapies, specific medicine, prevailing environment, negative thinking, increasing intolerance and other social problems were posing serious threats to us and we must take steps to cope with such challenges. He said that students of such sciences must master their subjects and must be aware of latest developments in their fields because role of all academic disciplines was very important in crime investigation. He congratulated Dr Nadeem Sheikh for organizing symposium on the topic successfully. Addressing the ceremony, renowned religious scholar and head of Jamia Naimia Maulana Dr Raghib Hussain Naeemi said that DNA report could be supporting evidence but it could not be used as initial evidence for making decisions in the Hudood matters. He said that Hudood Allah and number of witnesses are well defined in Islam. However, he said, a crime which fall under Hudood and where witnesses/evidences are incomplete, the judge can decide the matter on his discretion on the basis of secondary evidences including DNA analysis report. He said that DNA analysis laboratories must be established at government level and the technical experts must be highly qualified. He said ensuring high quality standards in DNA analysis could produce accurate results. 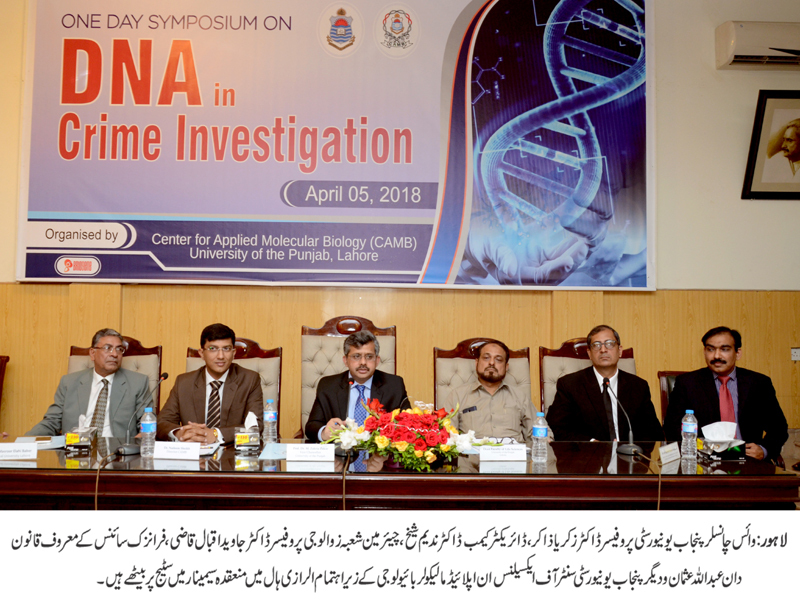 Dr Nadeem Sheikh said that incorporation of DNA analysis into crime investigation and paternity testing had proved to be of incredible importance in forensics. He said that analysis of human DNA had shown that every individual had unique DNA sequence except identical twins. He said that therefore, the DNA profile provided an excellent means to identify a criminal from a group of suspects. 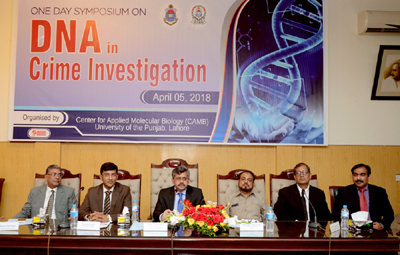 He said that in order to cope with changing needs of crime investigation, CAMB after series of validation studies and research work, establish the first DNA analysis laboratory in Pakistan in 2002. He said that the laboratory was equipped with state of the art facilities and was providing services for DNA analysis to the law enforcement agencies and courts. He said that the centre had also specifically trained medico-legal doctors on collection, preservation and dispatch of evidence material in sexual assault cases. He said that the purpose of organizing the symposium was to enlighten the biological, religious, physiological and legal aspect of DNA typing to focus its effectiveness in investigating crimes and finding the facts. He said that it would greatly help promote the uses of DNA technology as an effective tool to convict the guilty and absolve the innocent. Senior Research Officer Manzoor Hussain said gave technical details on DNA in biological perspective.